This week's theme is HEADS -"Getting There". Perhaps you remember the story of P.T., one of the many friends I have met on my photo walks. Yes, I'm often found along side the road, in a ditch, 'discussing' things with critters and bugs. P.T. is one of those friends I met during a walk, but I think he has a very important lesson to teach. Here's what I originally posted about P.T. . . .
"I met this critter while walking down the road earlier this week. As I was walking along, I saw this critter come out of the ditch on one side of the road and start making its slooooow trip to the other side of the road. So, I knelt down, introduced myself to P.T. 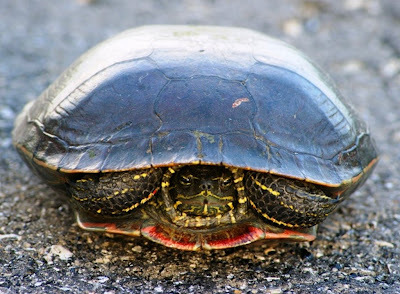 (that's its name... short for Painted Turtle, of course), shot a few pictures, and then carried P.T. over to the other ditch, because I wanted to make sure this critter didn't make the acquaintance of one of those big, shiny things with rubber wheels. I then continued on my walk, and when I returned to the spot where I had left P.T., I smiled, because P.T. had continued on the journey (probably to our pond)." You see, I think we are all working towards something. We all have some goal, big or small, whether it be to get a new job, to stand up to someone, to just make it though another day, or, like P.T. here - to make it 'home'. We're all trying to 'get there'. When I moved out here I met someone who had accomplished something that was a dream of mine, so I was very impressed with this man, and he gave me a piece of advice, which I really like. He said "Set your goals one step above what you think you can accomplish, because if you set your goal at something you know you can accomplish, you will 'get there' and won't have anything else to strive for, and you always need to have something to reach for. Just like P.T., even if the journey is slow and difficult, with bumps along the way, we need to keep on "getting there". Wise advice, there - and then, of course, be ready to set a new goal when you're approaching it. Great post, may each of us always have something to reach for. "He said "Set your goals one step above what you think you can accomplish, because if you set your goal at something you know you can accomplish, you will 'get there' and won't have anything else to strive for, and you always need to have something to reach for." I so loved this Misty.. So true.. Always strive for the top and if you make it even half way.. You're a winner!! Ohhhhhhhhhhh, so so excellent. What a great read. And an awesome new friend, I'm sure!!!! Wonderful photo. The story of the tortoise and hare is a great lesson. Study and sure will get you there. that's a nice lesson. yeah, we need to keep getting there. That second shot is great, Mist. Really grabbed my attention. I know you said last week you were having some trouble with photos, but it's not evident here, believe me!